Snuggled in a fertile valley at the base of Mt. Rainier in the State of Washington, lies the City of Puyallup. This city is recognized for its agricultural fertility as well as its pioneering heritage. This is a growing community where more than 100,000 people live, work and play. Most people in this Pierce County town are traditional, laid-back, conservative, and the town has the rural feel with parades downtown and a Farmers Market. As with our ancestors, this is a community of “generous people” and all are welcome to visit this beautiful valley. Because of its great location, lower housing, and fun activities, Puyallup’s population continues to grow every year. In 2016, the estimated population was 40,640. The type of culture in the downtown valley area appears to be slower and more mature while the South Hill area continues at a faster pace with what appears to be a younger demographic. The traffic on South Hill is much worse than the downtown area. The South Hill area also features more housing, restaurants, and shopping locations. Meridian is the main street in Puyallup and it can get you anywhere you would like to visit. After a while, however, you’ll want to use the back roads like Shaw Road to avoid the traffic jams. In 1833, the valley was only a collection of miscellaneous creeks, brush, and wild forest growth. It was overgrown and took many years to clear. The area was subjected to recurrent floods with massive log jams from the winding river. The first settlers traveled as part of the very 1st wagon train crossing the Naches Pass in the middle 1800s. Settled first around 1854 and called Franklin, it was devastated in an Indian raid only a year later by Nisqually and Puyallup Indians from whom this land was taken from. Located in an agricultural valley, Puyallup has consistent growth in berries, dairy farming and truck-garden produce, chicken, and is recognized for developing the woodworking and food-processing trades. The state of Washington has the Trout Hatchery and Agricultural Experiment Station located in this area as well. One of the first settlers to the area was Ezra Meeker. After inspection, he wasn’t to excited about living here because of all the work that would be need to clear the land. He discovered, however, under all the brush and trees was the most precious ripe dirt for growing. This was the start of the hops industry and this little town was leading the country. Meeker was the first to plant hops in the Puyallup Valley in 1865 (at the Pioneer Park) and it was a huge success for him and other local land owners bringing in millions of dollars. It was like striking gold for the local residents and of course Ezra Meeker making him and his family extremely wealthy. On December 3, 1928 at the Frye Hotel in Seattle, the most prominent figure and pioneer of the city died due to the complications of being sick (on and off with pneumonia). He was 97 years old. Today his resting place is at the Woodbine Cemetery in Puyallup WA. Puyallup Washington is suitably located between Seattle and Tacoma. It is about 35 miles south of Seattle and about 10 miles from Tacoma. The town is easy accessible from Interstate 5 and highway 167. With that being said, many families live here just for that reason. It is easy to get to both major cities and the cost of living is considerable much less. As noted above, the city name “Puyallup” is from the Puyallup Tribe of Indians and means ‘the generous people”. It is about 14.04 square miles which includes the Puyallup River. The City of Puyallup isn’t really a tourism area, however, the yearly Fair does bring in a lot of people (estimated one million) from all across the country. It is a very busy time of year so avoiding the downtown area is highly recommended due to the traffic. 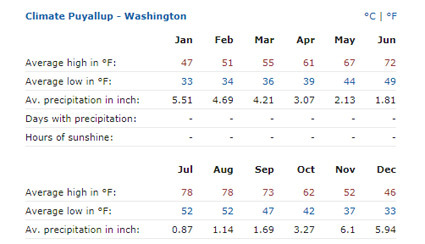 As far as the climate and weather in Puyallup, you’ll experience everything here. We have four well defined seasons (spring, summer, fall, and winter). It is considered and Oceanic Climate. The seasons and weather is very predictable each month. A 10-day weather forecast is available here. Snow fall here typically only last a couple days and some years we receive no snow at all. Elevation is 46 ft above sea level thought some areas (South Hill and North Hill) can go up to 500 ft. They are more prone to experience a higher level of freezing weather. Historic Meeker Mansion opened in 1887. There are historical landmarks in Puyallup but the one that is the most famous is the Meeker Mansion. This Mansion was constructed by one of the town’s founders, Ezra Meeker in 1886. He found his way here while Traveling along the Oregon Trail. 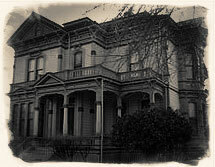 The Meeker Mansion is now administrated and owned by the Puyallup Historical Society. They have tours during the day of the 17 rooms 1890’s era mansion from the Victorian architecture. Visitors are also told the story of Ezra Meeker during the tour who was Puyallup’s first Mayor. View of Mt Rainier from the City of Puyallup. 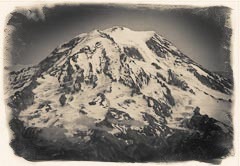 If you live in the City of Puyallup you are not far from Mount Rainier which is a landmark as well as sacred ground to Indians who referred to it as Tahoma. Mount Rainier rises 14,410 feet and the Mt Rainier National Park offers something for every member of the family. This includes: Fishing, hiking, ice caves, camping, skiing, gift shops, and inns. With this is mind, Puyallup is a great place for photography enthusiasts as well as hikers and travelers. Mt Rainier National Park is about 53 minutes from the City of Puyallup. There is always a fear of Mount Rainier erupting. The mountain could easily cause damage to local neighbors and downtown area. The city has lahar sirens and evacuation routes posted. No worries, you won’t have to travel far to be safe if an eruption ever does happen. The Puyallup School District is one of the most popular in Washington State. The district is the 8th largest and was the 3rd district formed in the state. We have 21 elementary schools, 7 junior high schools, and 3 senior high schools. The district serves 22,250 students in the area and was formed in 1854. Some of the popular schools in the downtown valley area include Spinning Elementary, Kalles Junior High, and Puyallup High School. While on the way to Mount Rainier you should stop at the Northwest Trek. You will find native Northwestern wildlife on a guided tram tour over 723 acres where elk, bison, moose, pronghorn and more wildlife freely roaming. You can stroll wood pathways to see forest cats, wolves and other animals. Your family can have encounters in the kid’s Discovery Center as well as enjoy the picnic meadow, nature trails, gift shop and café. There are also black and grizzly bears in this eight-acre exhibit. There are celebrations during the year, but you must not miss the Washington State Fair (Previously known as the Puyallup Fair). It is in the heart of the Puyallup Valley and one million visitors per year usually come to this fair. The fair ranks in the Top 10 of largest fairs in the United States. Every year in April, they have a smaller celebration called the Spring Fair. This has all types of home grown vegetables, goats to milk and gadgets to buy. Who can struggle to not eat buttery scones, cotton candy, or a fair burger with onions? Besides two marvelous fairs during the year, there are many other events full of fun hosted on the weekends. Craft fairs, home shows, car shows, horse shows, dog shows, and train shows are only a few of the events at their large fairgrounds. The concerts at the Washington State Fair feature some of the biggest acts in the country and admission into the fair is almost always include in the ticket price. During World War 2, the Washington State Fair was turned in a Japanese American internment camp (Camp Harmony) that held over 7,000 people most of which were Americans. It certainly was the lowest point for the town and the fairs history. During the Spring time, you can experience the annual Daffodil Festival. Started in 1934, it’s an event that celebrates all the agriculture achievements Puyallup and it’s surrounding cities have accomplished. This is a popularity community gathering which features a parade with music, schools, flowers, clowns, and lots of fun. It’s a celebration to our city, community, and all the people who make it thrive. After Puyallup’s hop industry died, daffodils and other flowers took its place. During the event, the streets are lined with chairs and 1000’s of folks who wait in anticipation for the parade. Another tourist stop in Puyallup is the Karshner Museum. The local museum was provided by Warner Melvin Karshner in memory of his son. Mr. Karshner was not only a Puyallup school teacher but also a doctor who delivered more than 2000 babies. He was also the driving force behind a cleaner city. The Karshner Museum is a fun place for children and families as they will learn about history, cultures, and habitats from across the globe. It is a hands-on adventure through time, full of everything from dinosaur fossils and bird feather to mid-1800s general store and a full-sized Native American tepee. This is educational for children and is open to the public. Puyallup also has a quite popular Farmers Market. When compared to other cities around Puyallup’s Farmers Market is one of the largest. This Farmers Market brings local farmers and growers together with people who sell crafts to the shoppers. Puyallup Valley market entices shoppers and people just browsing. You’ll see lots of families and their pets having a great time. Things to find include baked goods, espresso, plants, bulbs, cut and dried flowers as well as fresh herbs are dispersed among the farm fresh vegetables and fruit. There are many creative vendors with food that also offers an assortment of goodies you won’t normally eat. Recently Farmers Market at night has opened for those people who cannot make it during the day. This event is held at the Pioneer Park and you will see lots of dogs as well as entertainment. It’s been a tradition in the area for over 30 years! It is worth visiting day or night so be sure to check that out. I have yet to find a better farmers market anywhere in Washington State. You will also want to visit the Meeker Days celebration in Puyallup which is a much larger celebration where over 100,000 visitors enjoy the food and entertainment. It’s like our farmers market but much larger. The entire downtown area is shut down and blocked off for this huge event. There are well over 200 vendors and three stages for entertainment for every age to enjoy. You’ll discover blocks of food vendors, businesses, beer gardens, and of course dancing. It’s a good time to meet you neighbors. Meeker Days and The Fair are the 2 largest celebrations in Puyallup. If you’re in town during these festivals, you’ll surely want to check them out. People come from all over the state to experience Meeker Days in our small town. *View the City of Puyallup History Timeline. Our website will provide you with valuable information which will help you whether you are exploring our area as a possible relocation, or as a visitor, you will find the our team anxious to answer your Puyallup questions. We are proud of our community, and we want to share that pride with everyone. We are a local community website for people living in and around the City of Puyallup, Washington. We love the city and work hard to give the local residents as much information as possible. Over the last couple years we have covered a lot of topics. Our most common topics are city related as well as real estate, the Washington State Fair, restaurants, things to do, and of course many of the events happening every month. We receive thousands and thousands of visitors each month. Be sure to follow us on our one of our social channels. Our mission is to be a reliable source of information about Puyallup Washington. Many of our articles are about the city and will last for many generations to come. On our website you’ll find lots of photography and history information. We continue to work on that mission every day not only bringing you the most up to date information but also preserving the history of the city. Each day more and more residents discover our local community website and it’s a great feeling knowing local residents are finding it a useful local resource. Puyallup.com has had several owners over the years. It’s currently managed by a local management team who all live in Puyallup. We are compassionate about the area and do this for the community. We all believe that Puyallup is a great small town and that needs to be shared with everyone. Over the years Puyallup.com has gone through many revisions. It’s been owned since 1997. If you have something you’d like posted on our website, contact us and we’ll possibly add that for you. No jobs at this time but we do accept local article submissions, however. If you’d like to volunteer in the city connect with the City of Puyallup directly.